As expected, weekly unemployment claims bounced sharply higher this last week, up a whopping 46,000 from last week’s revised figure of 342,000. Last week, recall that the Labor Department reported a four-year low of 339,000 first-time claims. It was not a real number. I still think Friday’s jobs report will be revised away, but I am positive today’s “surprising” report will be (for the simple reason California forgot to report 30,000 claims). Actually, the report isn’t worthless, it’s simply erroneous. Add back in 30,000 claims and the number is 369,000 right about where it has been for some time. Economists were thus expecting about 370,000 claims this week, but amusingly claims shot all the way back to 388,000. So much for conspiracy theories regarding unemployment claim numbers. To better understand real trends we need to look at the 4-week moving averages of claims to help smooth out things like weather-related incidents (and California ineptitude). To put trends into a visual perspective, I asked Doug Short at Advisor Perspective for a year-by-year breakout, as shown above. 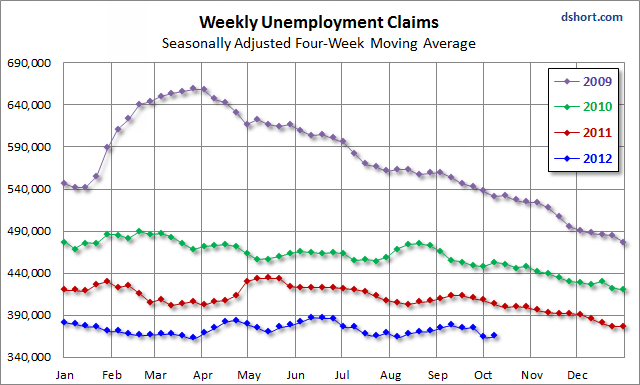 Note that weekly claims headed sharply lower in April of 2009 two months prior to the official end of the recession. There was a slow but relatively steady improvement in 2010, and a choppier improvement in 2011. In 2012, there has been no improvement since mid-February, and minimal improvement since the start of the year. 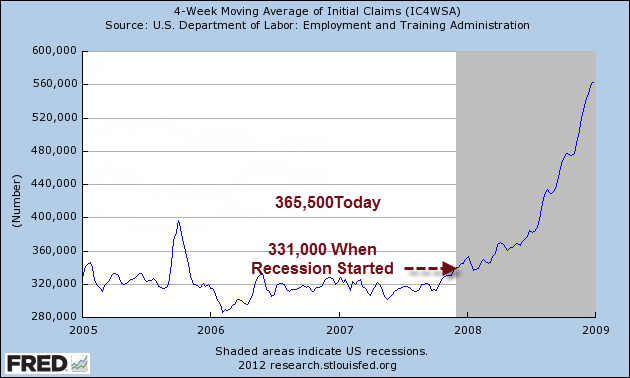 The four-year moving average of claims was 331,000 when the recession started. It is 365,500 today. At no point has the 4-week average of claims dropped below 360,000 since early 2008. If you are expecting a big jump in weekly claims prior to the recession, I doubt you get it. Indeed, if you stake the claim as I have, that the recession has already started, you already didn’t get it. Moreover, corporations are running pretty lean employee-wise and housing starts are bottoming (if not already bottomed), so one should not expect to see a similar spike in claims as we saw in mid-2008 and 2009.